Free Form Habitat Flex FR Epoxy Putty is a mix-and-apply-by-hand putty that is that is certified flame resistant (E84, Class A) and is used to create display elements that are semi-rigid and extremely tough. 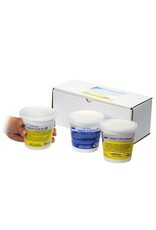 Habitat Flex FR is solvent free and contains no VOC’s. Working time is 90 minutes and handling time is 24 hours at room temperature (73°F/23°C). Cured epoxy has some flexibility with excellent impact resistance and abrasion resistance. Use with Habitat Folding Powder – fold powder into epoxy putty to thicken and reduce sag when applied to a vertical surface. Folding Powder also reduces stickiness and makes the epoxy more handle-able. Once putty is applied, it can be stamped with a silicone rubber stamp to create repeating patterns with intricate detail over a large surface area. Surface can be smoothed with alcohol or water. New Habitat Flex FR will bond to cured Habitat Flex FR without delamination. Habitat Flex FR will bond to a variety of surfaces including foam, metal, wood, PVC, stone and more. It is easy to paint with acrylic paints or stains. Use to make perfectly detailed tree branches, vines, planks and other themed elements for zoos and amusement parks. Because finished elements are semi-rigid, reptiles and birds can comfortably grip them without affecting the material.